Changing a “home” back into a “house” before it’s put on the market requires a great deal of storage. Real Estate Agents can sell a house faster and for more money when it is clean and clutter free. Depersonalizing a home makes it easier for a potential buyer to imagine their own family living there. Realtors have a simple solution with MI-BOX Moving & Mobile Storage. Realtors can have a homeowner rent an 8', 16', or 20' mobile storage container. 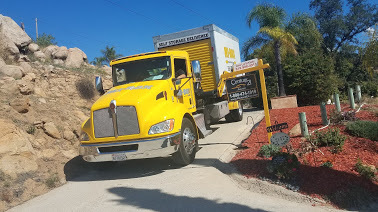 MI-BOX will deliver it to the homeowners driveway. Furniture, household items, and sentimental items can loaded and taken back to our secure storage centers. With less clutter, it's simple to complete any painting or sprucing up projects and leave your listing it's best showing condition. MI-BOX works with real estate agents and home staging companies. Once the seller has a new home to move to, the already packed MI-BOX unit can be delivered to the new house to be unloaded. So the storage units only have to be loaded and unloaded once. Your clients save time and money by selling their house faster thanks to your staging. The realtor also saved their client numerous trips to a self-storage facility. Realtors can save their clients time and money by using MI-BOX Mobile Storage & Moving on their next listing. Realtors and home staging companies are developing relationships with portable storage companies like MI-BOX to help their business. MI-BOX can offer preferred pricing and outstanding service. Let us help build your real estate business today. ​Find a MI-BOX location in your area to arrange MI-BOX moving and storage units for your next client.